Boggabri Coal is committed to sustainable environmental practices and compliance with legislative requirements. We operate under rigorous approvals and management plans which are approved by the State and Federal Government. Our environment staff work closely with government, independent consultants, and other mines in the area to manage any potential impact on the environment. Through a regular monitoring program, we track the success of our environmental initiatives to ensure we are delivering on our commitment to preserve the region’s biodiversity and environmental outcomes. The project area is located adjacent to and within Leard State Forest. The area is zoned for mineral extraction, forestry, and recreation under the Forestry Act 2012. The Leard State Forest was logged by Forests NSW in the 1980s in anticipation of mining activities. 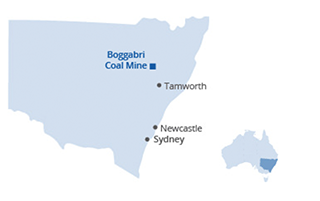 Boggabri Coal progressively rehabilitates the mined area to re-establish pre-mining biodiversity values, according to the approved Rehabilitation Management Plan. An independent third-party audit conducted in 2012 found that within four years, our rehabilitation had already achieved almost 70 per cent diversity compared with the existing flora and fauna in the Leard State Forest. More than 30 woodland and grassland bird species live in the rehabilitation, including the speckled warbler, which is listed as ‘vulnerable’ under the New South Wales Threatened Species Conservation Act 1995. Newly established communities of the critically-endangered White Box Yellow Box Blakely’s Red Gum Grassy Woodland and Derived Native Grassland are also flourishing. Boggabri Coal has acquired more than 11,500 hectares of biodiversity offset areas. An independent audit of our biodiversity offsets in December 2013 confirmed Boggabri Coal has exceeded the habitat area required under our approval conditions for the Greater Long-eared Bat, the Regent Honeyeater, and Swift Parrot.